Arts Santa Mònica presents ‘Black is Beltza’, a project by Azkuna Zentroa and Fermin Muguruza. This exhibition of Fermin Muguruza is about a graphic novel of the same name created together with the writer Harkaitz Cano and the illustrator Jorge Alderete. 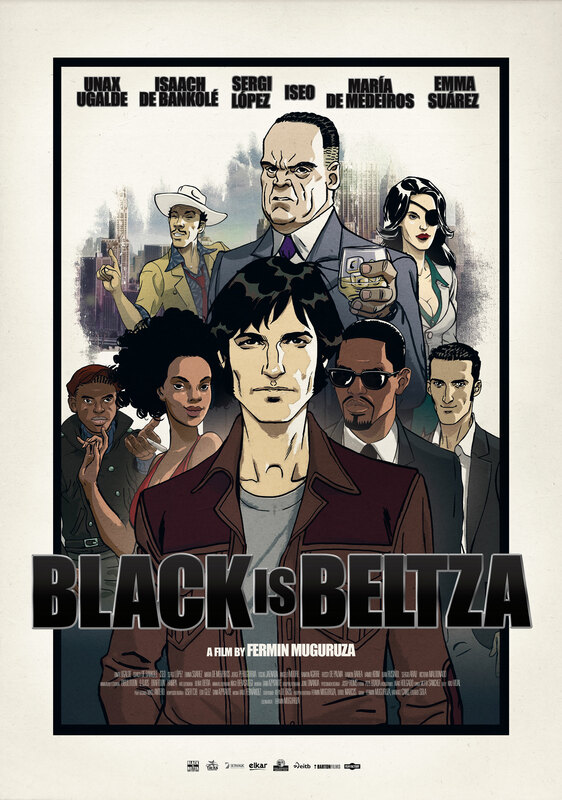 ‘Black is Beltza’ builds a history of action and espionage which mixes music, love and revolution. The story is told from the viewpoint of Manex Unanue, and talks about the events which marked the convulsive society of the mid-60s. The exhibition shows material directly or indirectly drawn from the different stages of the project, i.e. from the photographic archives which have helped the authors structure the story, to the original drawings of the graphic novel or the audiovisual materials narrating the cultural and Socio-political panorama of the time. ‘Black is Beltza’ includes a public programme of parallel activities to be held in the exhibition space with musical talks, guided visits, conferences and Master Classes in relation to the topics tackled in this project. Fermin Muguruza: He is known for his wide career in the music field; Kortatu, in the decade of the eighties, Negu Gorriak in the nineties, and as a solo musician, afterwards. However, during the last eight years he has also worked in the audiovisual field. Apart from the feature films “Bass-que Culture”, “Checkpoint Rock. Canciones desde Palestina”, “Zuloak” and “No More Tour”, he has also worked on eleven documentaries about the Arabian music such as “Next Music Station”, directed for the Al Jazeera channel. Nowadays, he is the programmer of the music documentary department at Mexico DOCSDF and Cine Migrante from. Harkaitz Cano: His most recent published books are Twist (2011), the poetry book Compro oro (2011), and the collections of short stories Neguko zirkua (2005). Cano has taken part in a number of performances combining literature with music and other arts. He has published two book as a comedy screenwriter. He also wrote alongside Fermin Muguruza the script of the black novel ‘Black is Beltza’ (2015). Nowadays he is working on his first theater play. Jorge Alderete: Born in 1971 in Argentinian Patagonia, he is an illustrator and artist whose works have been published in several specialized anthologies, in many galleries and museums around the world. He has designed around 100 albums, posters and more groups from different countries, and he published three books prior the novel ‘Black is Beltza’. He is the co-owner of the first design store and gallery in Mexico City.